The collaborative effort that grew to become the Downeast Institute began in 1987 on the clam flats of six Washington County communities. Clammers and town officials, concerned about declines in soft-shell clam harvests, teamed up with Dr. Brian Beal, a professor of marine ecology at the University of Maine in Machias. 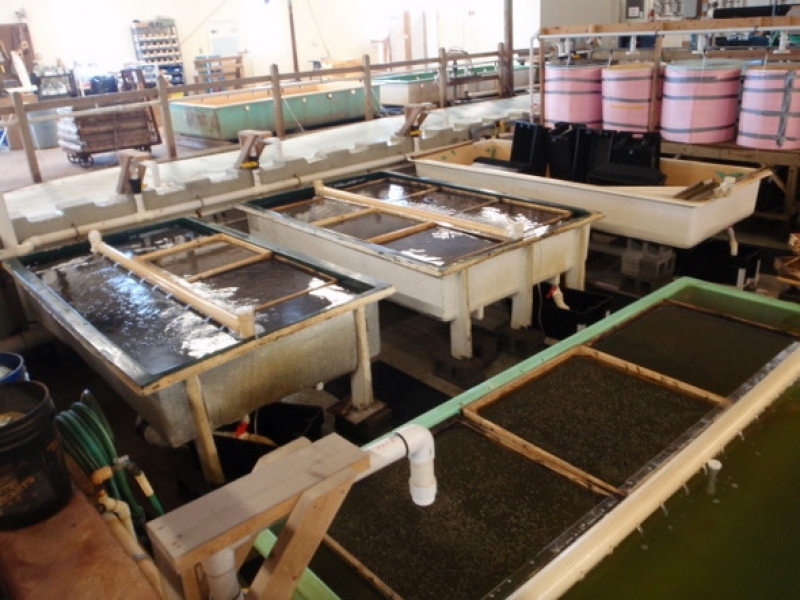 They created the Beals Island Regional Shellfish Hatchery (BIRSH) – a facility where wild clams were spawned, clam larvae and juveniles were reared on diets of cultured algae, and seed clams were produced for planting on the depleted municipal flats. BIRSH, opened the doors to its 1,6002 facility on a wharf overlooking Moosabec Reach in May 1987. It was Maine’s first public shellfish hatchery. 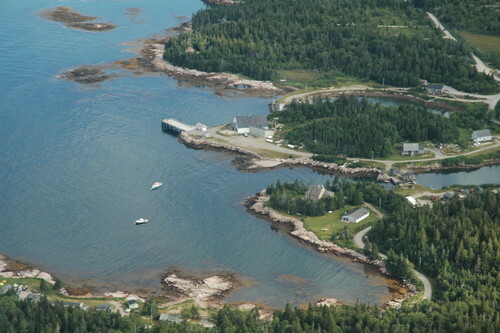 The Beals Island Regional Shellfish Hatchery at its original home on Perio Point. Over the next 16 years, the former clam shucking shed produced hundreds of millions of seed clams for more than 40 Maine coastal towns and a few communities in New Hampshire and Massachusetts. Shellfish production efforts and the accompanying applied research were conducted under Dr. Beal’s direction by a mix of UMM students and staff paid with public and private grants. BIRSH developed techniques for growing, overwintering, and seeding clam flats, passing along those technologies to municipal shellfish committees, clammers, and the scientific community through published articles in a number of research journals. In 1996, BIRSH organized as a non-profit 501(c)(3) corporation. Its Board of Directors includes residents of Maine’s coastal communities and fishermen as well as specialists in marine resources, education and business. In 2000, the Board changed its name from BIRSH to the Downeast Institute for Applied Marine Research and Education (DEI) to more accurately reflect its mission. During the summer of 2003, DEI moved from its home at Perio Point on Beals Island to Black Duck Cove on nearby Great Wass Island with the goal of renovating a 9,600ft2 building that had been being used for temporary storage of lobsters into a shellfish production facility. The site has more than 2,000 feet of deep water frontage and two working lobster pounds. 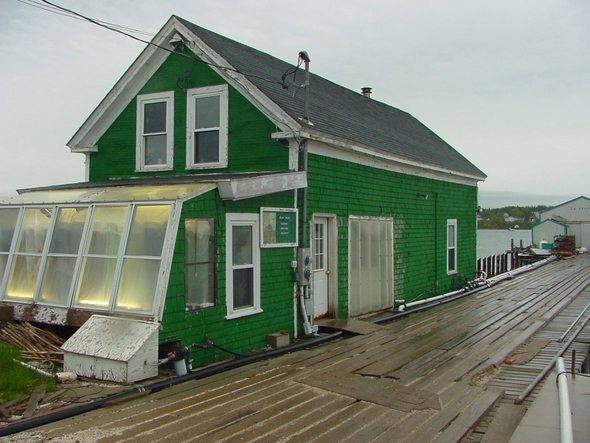 Also in 2003, the Downeast Institute formally agreed to serve as the Marine Science Field Station for the University of Maine at Machias. Through this arrangement DEI provides opportunities for undergraduate research and our facility is used by educators and researchers from that campus. In addition, the DEI Board of Directors envisioned using its new home to create the easternmost marine research laboratory and education center in the US. 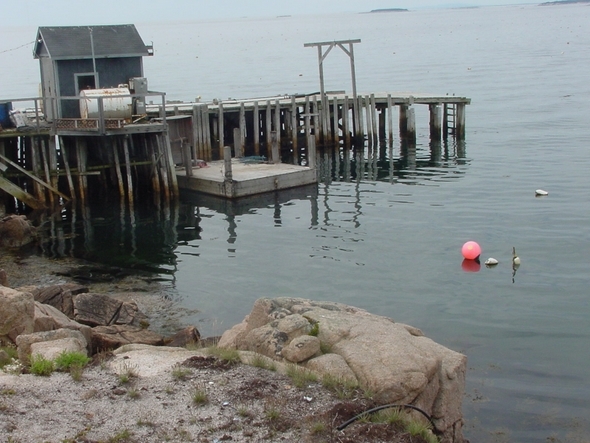 Above: The lobster holding facility and original wharf that was to become DEI’s new home on Black Duck Cove on Great Wass Island in Beals in June 2003. In March of 2006, with help from the Trust for Public Land, support of Maine Senators Olympia Snowe and Susan Collins, and the Maine Technology Institute, DEI used federal and state grant funds to purchase the eight and a half acres and associated buildings at Black Duck Cove. 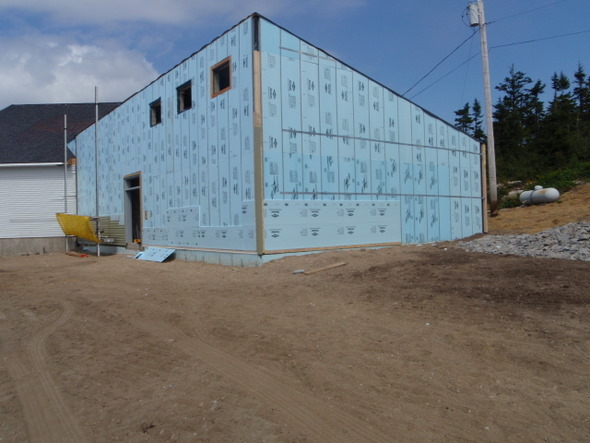 The Institute fulfilled its plan to convert the property’s former lobster tank building into a production and research shellfish hatchery, and also built a running seawater laboratory. 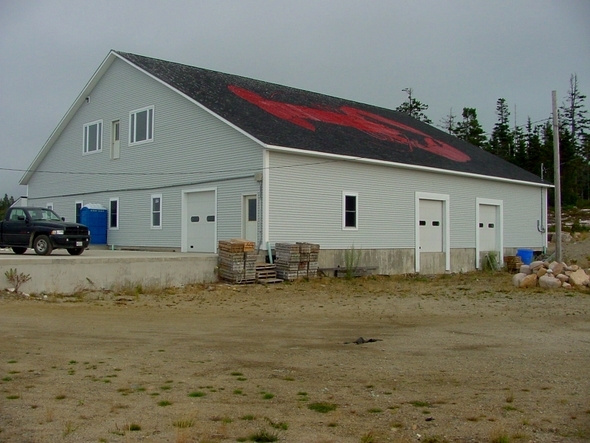 In 2003 the lobster holding facility was converted to a working shellfish production facility. 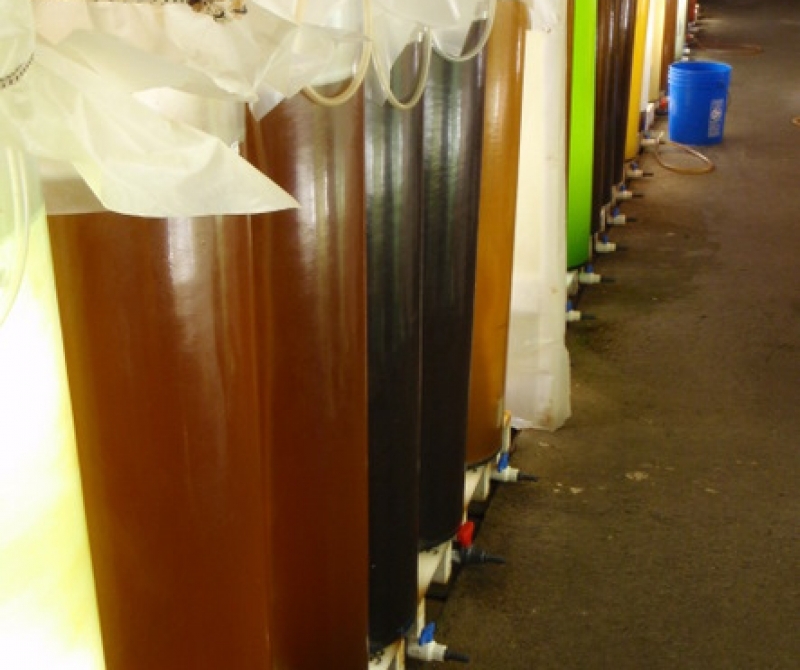 Mass algal culture system for feeding shellfish at DEI. DEI took the first step toward becoming the easternmost marine research laboratory and education center in the US in 2010. 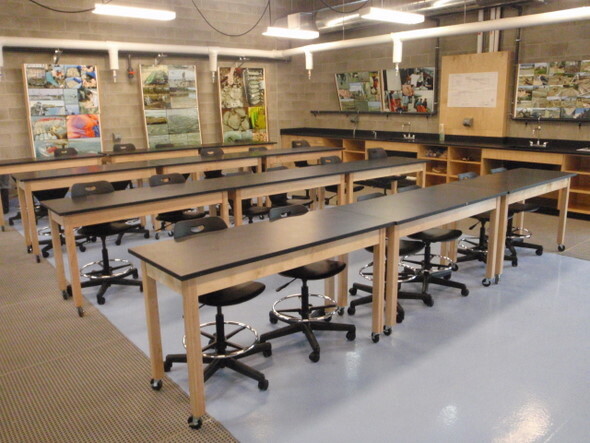 With grant funding through the Maine Technology Institute‘s Maine Technology Asset Fund and the National Science Foundation’s Partnerships for Innovation program, a state-of-the-art marine education center was constructed at DEI. This 1,000-square foot structure is well-equipped for classroom teaching, laboratory research projects, and other non-traditional classroom uses. It has running seawater, freshwater, white boards, drop-down electrical boxes for microscopes, PC projectors, and an extensive floor drainage system. The classroom seats 30 people and was opened in December 2010. DEI's Marine Education Center under construction (July 21, 2010). DEI's Marine Education Center under construction (August 20, 2011). DEI's completed Marine Education Center (April 2011). The Education Center hosts programs, like Marine Science Days, for local K-12 teachers and their students. DEI’s education programs incorporate the marine environment into science, math, and other subjects. 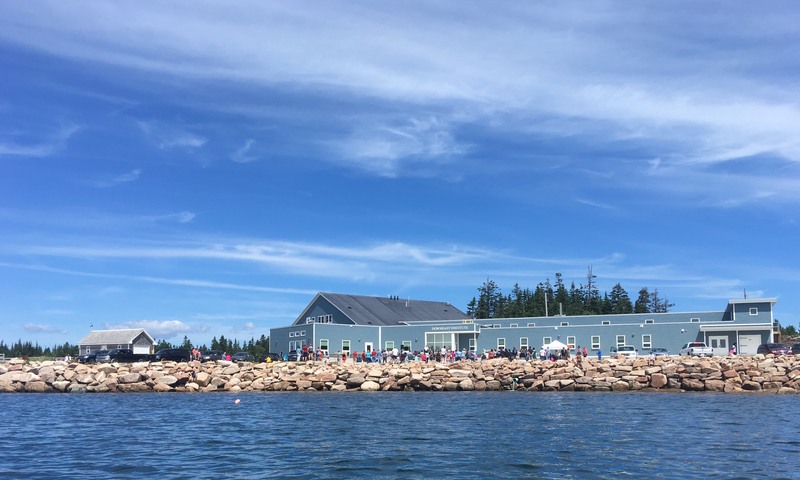 This facility, along with our rocky shore and working shellfish hatchery, has enabled DEI to provide ongoing programming to 6000 K-12 students, college students, educators and learners of all ages from 2011- 2015. 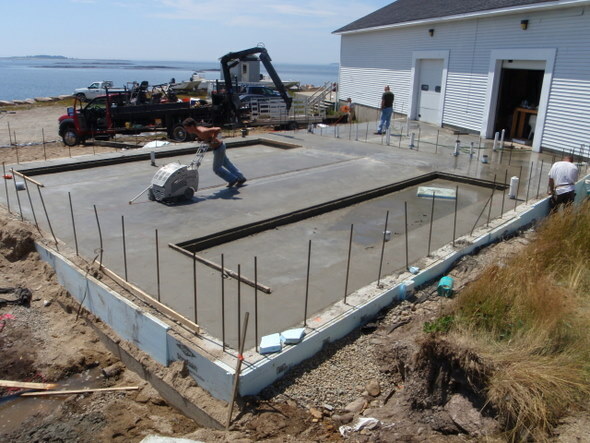 At the same time that DEI built its Education Center, funds through the Maine Technology Institute’s Marine Technology Asset Fund (MTAF) helped DEI build a new pier to replace the old one. The new pier is 100-ft long x 30-ft wide and is constructed of fiber composite materials. The ribbon-cutting ceremony for the pier was held at DEI’s Annual Shellfish Field Day in August 2012. Aerial photo showing DEI's campus in 2013 after the completion of the Education Center and Pier Replacement (photo by DEI Board member Dr. Wes Hedlund). DEI’s ultimate goal of building a fully equipped marine research laboratory, expanding its shellfish hatchery, and adding a conference room and residence hall was finally realized when we broke ground on the final phase of the expansion in June of 2017. The expanded marine laboratory and education center is designed to attract marine scientists and students who wish to explore and learn about the marine environment in eastern Maine. The presence of a marine lab 25 miles from the UMM campus creates seasonal exchange opportunities for scientists and students from marine labs in the southern U.S. and beyond. 4) The general public to learn through programs in the conference room and education center. The Easternmost Marine Research Laboratory and Education Center in the United States after the 2018 expansion. The Next Generation of Maine contributed $2 million towards the facility expansion in November 2014. These “seed” funds leveraged another $2 million from the University of Maine at Machias/ Alliance for Maine’s Marine Economy (through the State of Maine and the Maine Technology Institute), $1.8 million from the Harold Alfond Foundation, and funds through the New Markets Tax Credit program (facilitated by Consortium America LLC ) that were needed to complete the expansion.